Innovation: A software-driven system allows the vehicle to fire only the number of cylinders needed, based on speed and load, saving fuel and reducing emissions. 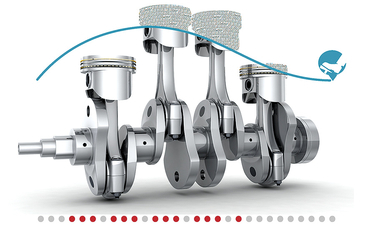 By digitally controlling the number and order of active cylinders, the software creates a variable displacement engine that runs closer to peak efficiency. Judge's Citation: The conventional approach to cylinder deactivation favors symmetric two-mode deactivation. Tula's Dynamic Skip Fire technology defied that assumption by skipping, or firing, individual cylinders dynamically on an event-by-event basis. Through careful control of the number and sequence of combustion events using sophisticated algorithms, engine operation occurs near peak efficiency, creating a software-controlled variable displacement engine. As cylinder deactivation can create objectionable vibration, Skip Fire uses patented firing control algorithms that avoid sensitive frequencies. It enables a quality driving experience while reducing carbon dioxide emissions 8 to 15 percent, depending on engine displacement and cylinder count, with no impact on regulated emissions. Tula partnered with General Motors to integrate the approach as Dynamic Fuel Management into its 5.3-liter and 6.2-liter V-8 individual cylinder deactivation engines on the 2019 Chevrolet Silverado and GMC Sierra platforms.